Jagadguru Shankaracharya Swami Bharati Krishna Tirtha (hereafter "Bharati Krishna") lived from 1884 to 1960. He is said to have reconstructed the ancient system of Vedic Mathematics from certain Sanskrit texts which other scholars had dismissed as nonsense. He tells us that the Vedic system which he rediscovered is based on sixteen Sutras which cover all branches of mathematics, pure and applied. The methods he showed and the simple Sutras on which it is based are extraordinarily simple and easy to apply, and the whole system possesses a unity not found in conventional mathematical methods. It can hardly be doubted that Bharati Krishna's remarkable discoveries in mathematics will in time change the teaching of and approach to mathematics worldwide: but this was not his main interest in life. His life was devoted to helping those individuals he could and also helping to bring about world peace and spiritual renewal. This short article aims to show something of his character and life and is drawn mainly from an introduction by Mrs Manjula Trivedi in the book "Vedic Mathematics" by Bharati Krishna. She looked after Bharati Krishna in the last years of his life and afterwards took charge of the Foundation he set up in Nagpur in 1953- the Sri Vishwapunarniman Sangha. According to Manjula Trivedi, Bharati Krishna "named as Venkatraman in his early days, was an exceptionally brilliant student and invariably won the first place in all subjects in all the classes throughout his educational career. . . at the age of just twenty he passed M.A. Examination in further seven subjects simultaneously securing the highest honours in all, which is perhaps the all-time record of academic brilliance. His subjects included Sanskrit, Philosophy, English, Mathematics, History and Science". In 1908 he was made first Principal of the newly started National College at Rajmahendri, a post he held for three years. Having a "burning desire for spiritual knowledge, practice and attainment" he then spent many years at the most advanced studies with the Shankaracharya at Sringeri in Mysore and was given the name Bharati Krishna Tirtha when he was initiated into the order of Samnyasa at Benares in 1919. He later, in 1925, became a Shankaracharya (the highest religious title in India). He believed in the ancient Vedic tradition of all-round spiritual and cultural harmony, and his ambition for humanity was a world-wide cultural and spiritual renewal. People flocked to him in crowds and waited at his doors for hours. Granted an interview with him people felt that he immediately knew their need. Even when suffering from excessive strain he refused to take rest, continuing with his studies, talks, lectures and writings with unabated and youth-like vigour and enthusiasm. In 1958 Bharati Krishna went on a tour to America, addressing audiences in hundreds of colleges, universities, churches and other institutions. This was organised by the Self-Realisation Fellowship. He also gave talks and mathematical demonstrations on television and gave some lectures in the UK on his way back to India, in May 1958. Bharati Krishna wrote sixteen volumes on Vedic Mathematics, one on each Sutra, but the manuscripts were irretrievably lost. He said that he would rewrite them from memory but owing to ill-health and failing eyesight got no further than writing a book intended as an introduction to the sixteen volumes. 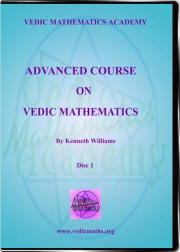 That book "Vedic Mathematics", written with the aid of an amanuensis, is currently available and is the only surviving work on mathematics by this most remarkable man.